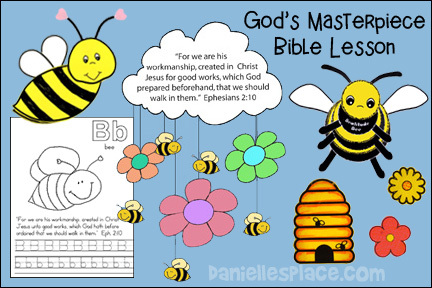 In this lesson children learn about bees and how amazing God created them. Bees are perfectly suited for their job. If God created these tiny little insects for such an important job, how much more important is the job you were created for. Just like the bees God has a plan for you. But you are much more important then any insect. You were created in God's likeness . . . 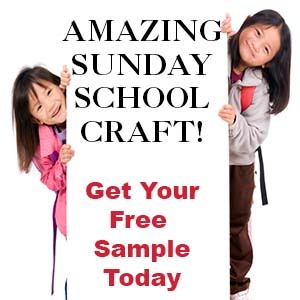 The following crafts come from the Bible Lesson "God's Masterpiece" and are available to members on The Resource Room. 1. Print out the patterns and make copies. 2. In class have the children color the pictures and cut them out. 3. Punch holes in the bees, flowers and bottom of the cloud. Tie thread to the flowers and bees and then tie them to the cloud. Punch a hole at the top of the cloud and tie a piece of thread to hang the mobile. Decorate a plastic cup with flower and bug stickers and then plant some flower seeds. Use the bee pictures to make plant stakes by gluing the bees to a craft stick. Have the children draw flowers on a piece of paper and press their thumbs onto an ink pad. 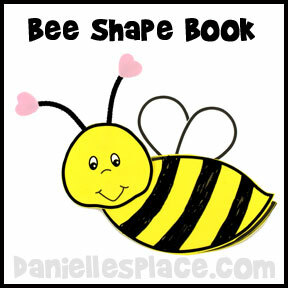 Show them how to draw faces and wings on the thumbprints to make bees. 1. 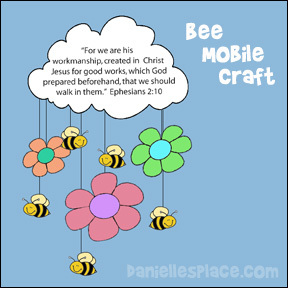 Before class print out the bee body patterns onto card stock for the back and front cover, and onto printer paper for the pages. Cut out the cover and page patterns and staple the pages together with a cover on the front and back and several pages in the middle. Cut chenille stems in half for the antennae. 2. In class have your children glue the head shape to the body pages and the wings to the back of the book as shown in the picture above. 3. Fold a chenille stem in half and tape it to the back of the head. Glue heart shapes to the ends of the chenille stems. 1. Print out the Flower Patterns onto different colors of card stock and cut them out. 2. On the back of each flower write one word of the memory verse. Write the memory verse on the board in big letters. Mix the cards up and place them on a table so that the words don't show. 3. Have the children take turns turning over the cards until someone finds the first word of the memory verse. When a child finds the first word have him tape it to the board under that word. Then have the children look for the second word and third until all the words are gone. 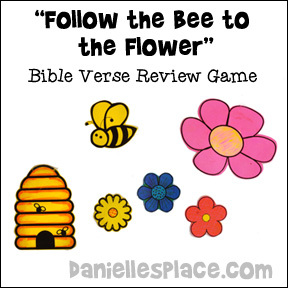 Play "Follow the Bee to the Flower"
1. Print out the Flower Pattern, Beehive, and Large Flower Pattern and cut them out. 2. On the back of each flower write one word of the memory verse (you don't have to use the whole memory verse). Make a bunch of extra flowers with no words on the back. Place the large flower at one end of the table and the beehive at the other. Place the flowers with the memory verse in a zigzag row leading to the big flower so that they are in the order of the verse. Place the extra flowers in between the memory verse flowers. 3. Have the children take turns being the bee. A child should start at the beehive and turn over a flower that is close to him. 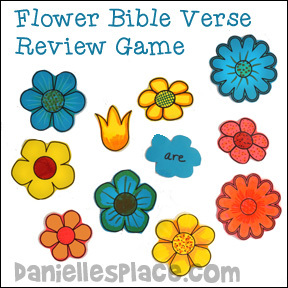 If the flower contains the first word of the memory verse, he continues turning over flowers until he turns over a word that doesn't belong in the Bible verse. If he finds the first word, he can then turn over another flower nearby looking for the second word of the verse. If he doesn't pick the right word he has to go back to the beehive and wait for his next turn to try again. You can turn over all the flowers again so that none of the words show or you can have the next child continue where the first child left off. The first child to reach the big flower at the end wins. Or keep playing until all the children can get to the big flower by remembering the sequence of flowers. The Bee Tree - A little girl, tired of reading, wants to go outside and play. Her grandfather uses the opportunity to teach his granddaughter the importance of reading by taking her on a hunt for a bee tree. The little girl learns that just as there is sweetness in honey, there is sweetness inside a book too. Her grandfather says, "Adventure, knowledge, and wisdom don't come easily. You have to pursue them. Just like we ran after the bees to find their tree, so you must also chase these things through the pages of a book! 1. Cut off one leg of tights (pantyhose) and put in one handful of grass seed. 2. Stuff the pantyhose with sawdust to get round shape. 3. Tie knot in bottom. 4. Pinch some of the sawdust and twist elastic (rubber) band round to form nose. Sing a song to the Tune of "The Farmer in the Dell". Slap your thighs and clap your hands as you sing it. God made me, God made me, God made everything and God made me. God made Dustin, God made Dustin, God made everything and God made Dustin. God made me a helper, God made me a helper, God made everything and God made me a helper. Children love songs that have their name in them or something about them. They love the attention, it connects the concept or lesson to them, and they pay attention better because they are a part of what is going on. This song was sent in by Narita Roady.